This past weekend, Hurricane Matthew ripped through the Caribbean and southern United States, devastating much of what was in its path. The storm is responsible for taking over a thousand lives, 33 of them in U.S.. It is the deadliest hurricane since Stan in 2005, and the first category 5 Atlantic hurricane since Felix in 2007. The storm felled trees, snapped power lines, and shredded the roofs off of buildings. Asphalt shingles still litter the streets, and property owners are left with the task of rebuilding. Throughout it all, this slate sided home on Tybee Island, Georgia, survived without a single missing tile. Tybee was one of the first areas to evacuate and took the brunt of most of the damage, with winds reaching up to 96 miles per hour. Slate tile is an extraordinarily durable material that is renowned for its innate fire and water-proof properties. In freezing conditions, slate tile has also proven effective against hail. What is lesser-known about this popular roofing material is its resilience during natural disasters. Saint Sylvester’s Church in Pensacola, Florida, has seen her fair share of destruction. Since being built, the slate-sided house of worship has endured 4 hurricanes. Through each one, not a single slate tile was lost. Although slate tile is often passed over for cheaper roofing options, homeowners in areas susceptible to natural disasters will likely spend more on repairs than the cost of a slate roof installation. On average, slate roofing is expected to live over 100 years— a sharp comparison when considering asphalt shingles, which need replacing in about 30 years. 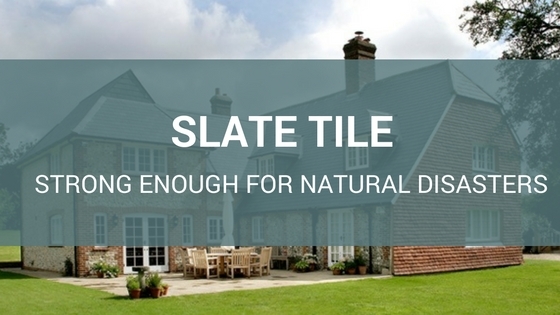 Slate tile has a number of other properties that make it a solid choice for building material. Thanks to its natural properties, only minimal processing is needed from quarry to roof, eliminating much of the release of harmful CO2 and saving water. It also has a timeless, classic beauty. Many structures that have added slate tile increase in market value. While slate tile has typically been used as a roofing option, slate siding has become more and more popular. 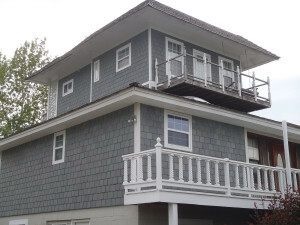 Click here to view some more slate siding projects. Vermont Slate Company expresses deepest condolences to those affected by the storm. To help the victim’s of Hurricane Matthew, click here.